GOD’S ORIGIN? If God made everything, where did God come from? Good Question – bad attitude! But sometimes you can sense that a person’s attitude is actually a mask hiding their real enquiry and I felt burdened by the Holy Spirit that this was the case in this instance. So I did what I always do when asked a tough question – I quickly asked the Lord for a good explanation, and here is what I told the young man. The Bible says we are made in God’s image which is one reason man has many characteristics the Bible describes God as having. God is the creator, so man is creative – we make things too. We do things that can’t happen by themselves. It also means we can therefore explore the relationship of a creator to his creation since we play creator all the time, even if on a much smaller scale than described in Genesis. All of which is a great help in finding out where God came from. So let’s do a mind experiment. Imagine that I invented the lectern I was standing at. (This is not true as I am much better at smashing rocks than I am at putting things together but nevertheless it makes the point.) I (the creator) existed before the lectern (my creation). I was not a part of the object. I was smarter than the object could ever hope to be and the lectern depended on me (the creator) for its continued existence, and not vice versa. Just give me an axe and it’s easy to demonstrate. Now let’s apply that relationship between a creator and His creation, to the very first things God created listed in Genesis 1:1-5. Firstly He made the heavens, i.e. space. God existed before space and He isn’t a part of space. He is smarter than it, and it depends on Him so don’t be surprised He later says he can roll up the heavens like a filthy rag and throw it over his shoulder. ( Ps 102:24-27, Heb 1:10-12) But it also means that if you ask how big God is, then that question doesn’t have an answer for the simple reason that God is not confined by the properties of the length, breadth and height He invented on day one. They were and are defined by Him. Similarly when the Creator “called the light day and the darkness He called night and the evening and the morning were the first day”, God invented time. As a result when you inquire how old God is, the question simply doesn’t apply to Him. He existed before time, He is outside of time, He is smarter than time and time depends on Him and not vice versa. It also means one further thing: You and I who are constrained by time, actually have a start and a finish. Therefore, when we leave God’s revealed truth out of our mindset, we foolishly think that everything must be confined by time, and in so doing time becomes our god. It is why evolutionist thinks given long enough life can happen all by itself. But time is not a creative entity, time is a created item. It makes nothing happen. But this also means that the creator of time is outside of time i.e. 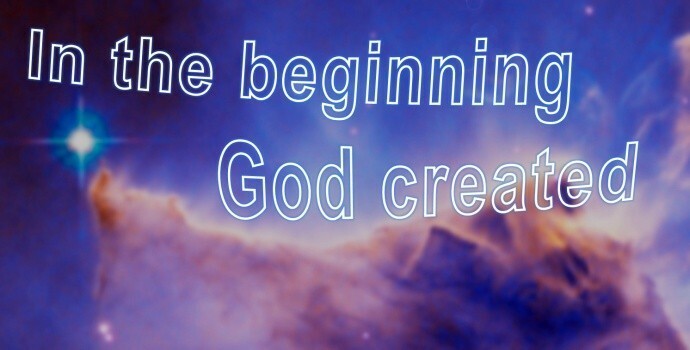 God had no beginning and He has no end. In the Gospels we read Jesus making this same eternal God claim about himself “… before Abraham was, I AM.” (John 8:58-59). Only this continuing present tense ‘verb to be’ type statement ‘I AM” fits the situation for someone who had no beginning, and who has neither age nor ending, which is as equally true for God the Father, as it is for God the son who is Jesus. How did the young man at the youth meeting react? He sat dumbfounded after the answer as all his friends left and I slowly approached and asked if he really wanted to get serious about Jesus. Yes, he stammered. A little later downstairs – we prayed together as he asked Jesus Christ to forgive his sins and to become his Lord and Saviour. So can you!